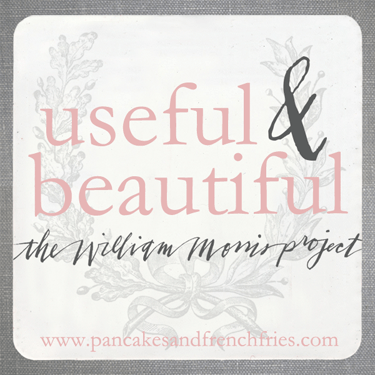 The best thing about the William Morris Project is the motivation. I had planned to work on a project yesterday, but when I went to the basement to throw in a load of laundry, I discovered water on the laundry room floor, puddling under the furnace. After some investigation with a flashlight to determine where the water might be coming from, I called the HVAC repair service and they found a leak in the humidifier as well as a leak in the furnace flue. Needless to say, there went my morning and $200. So I had no post ready for this morning, and I wasn’t exactly raring to go after I sent everyone off to school. 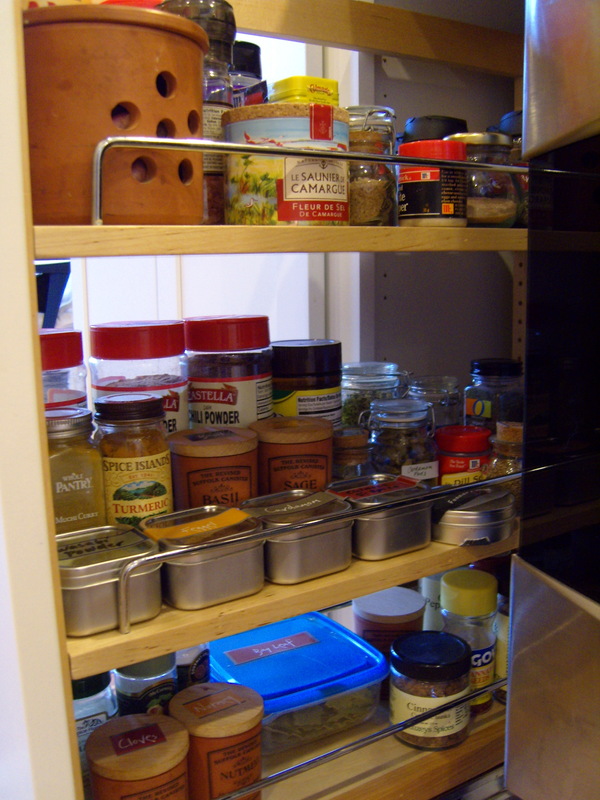 But then I read Jules’ post about organizing her recipe files (I so need to do that), and Tiffany’s post about organizing her spice cabinet, and I decided I wasn’t going to be left behind. I raced through the shower, got a second cup of coffee, and got to work. 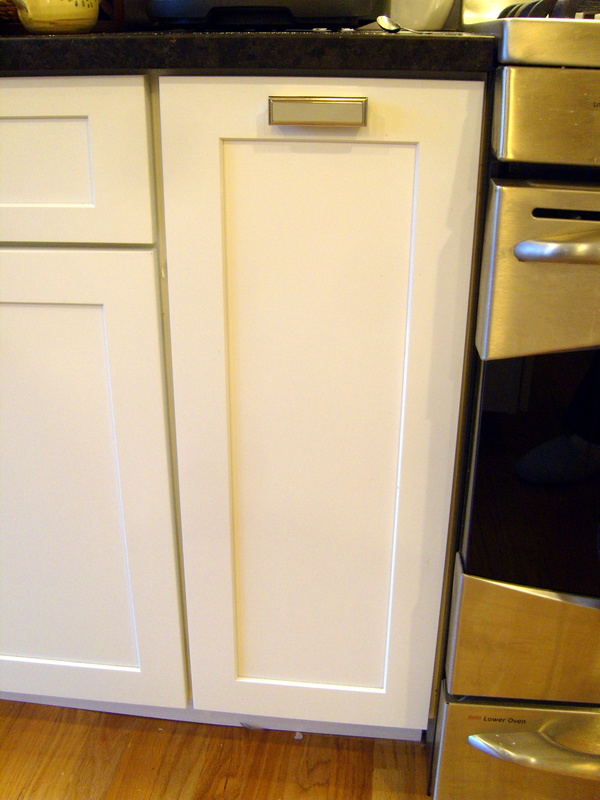 When we remodeled our kitchen a couple of years ago, we had this 12-inch space for a cabinet next to the stove, and decided it was too narrow to store anything useful in a standard cabinet. A pull-out spice cabinet just fit in that space, and we certainly needed storage for spices. It seemed a perfect solution, until it was actually installed and I tried to put the spices in it. There were too many shelves, and there wasn’t enough space for the taller containers. You can’t pull the cabinet out more than halfway (this may be adjustable, but so far I can’t figure out how), so it’s hard to see and reach anything in the back. I tried several times to remove one of the shelves, but couldn’t maneuver it out of the tight space. So we’ve just tossed things in and rummaged around, and while I could usually find what I wanted, it drove my husband crazy. Crazy. I found him grating a cinnamon stick into his cappuccino the other day because he couldn’t find the ground cinnamon. 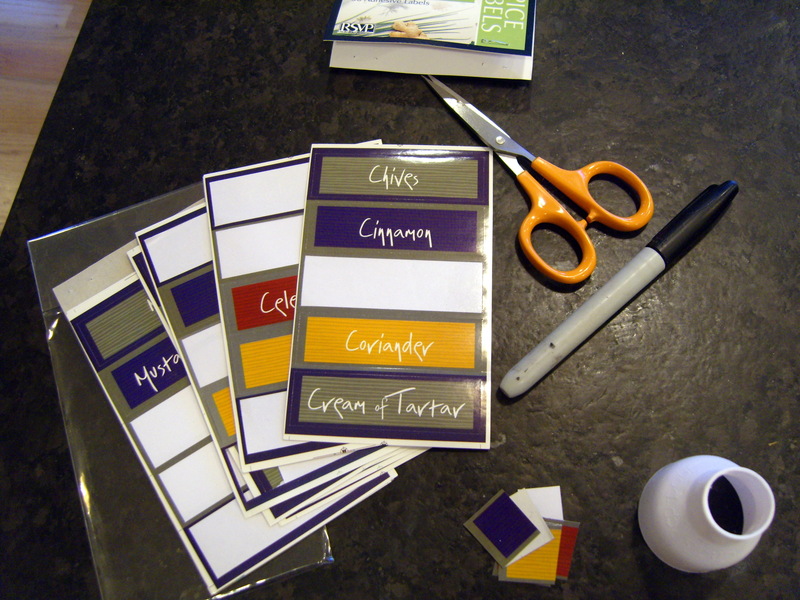 For Christmas he gave me a pack of spice labels (to be fair, I love practical gifts). Subtle, no? Step 1: Empty the cabinet. Yikes. Look at that, I needed an aerial shot. Step 2: Remove that annoying extra shelf. No photos here, but it involved some pliers, a hammer, and divine intervention. Step 3: Sort spices. 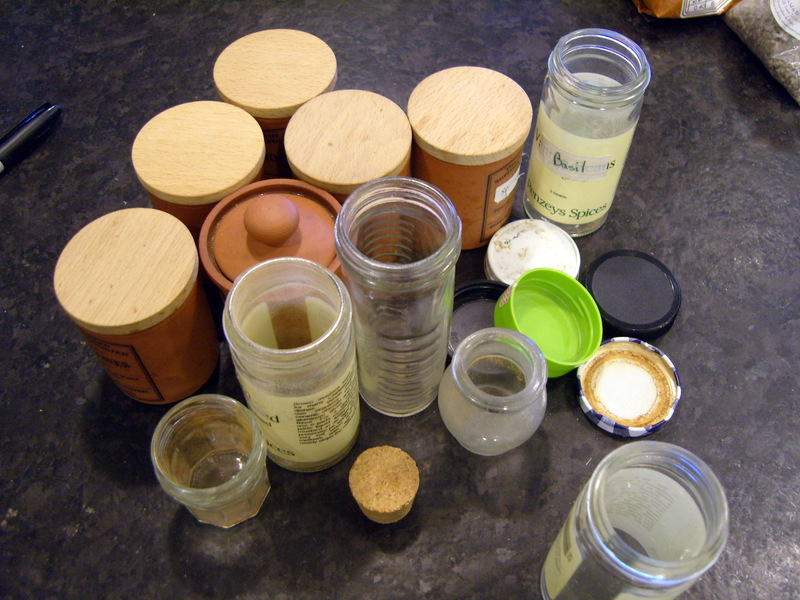 Weed out the empty jars and stale spices; combine multiples. Label everything. 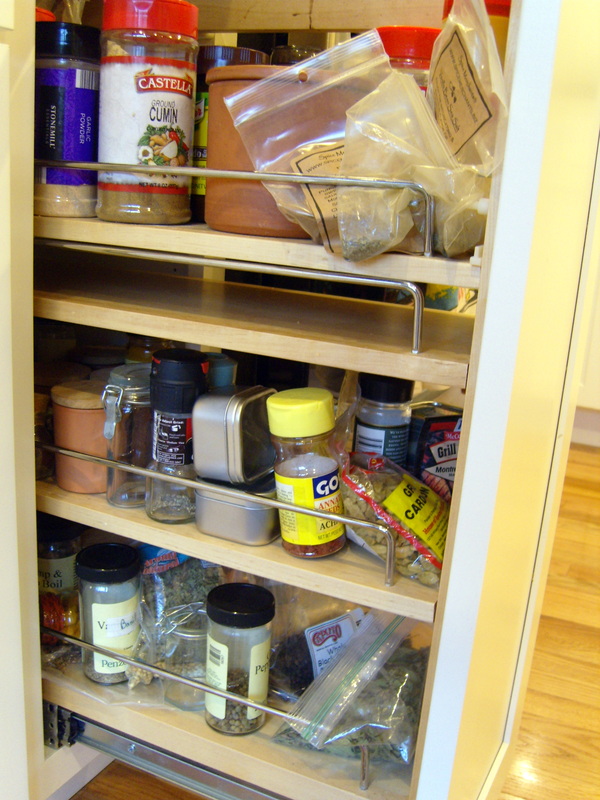 Step 4: Wipe off the shelves and put spices back in some kind of order. I put the most-used on the top shelf (garlic cellar, salts and peppers, and spices I tend to reach for several times a week). 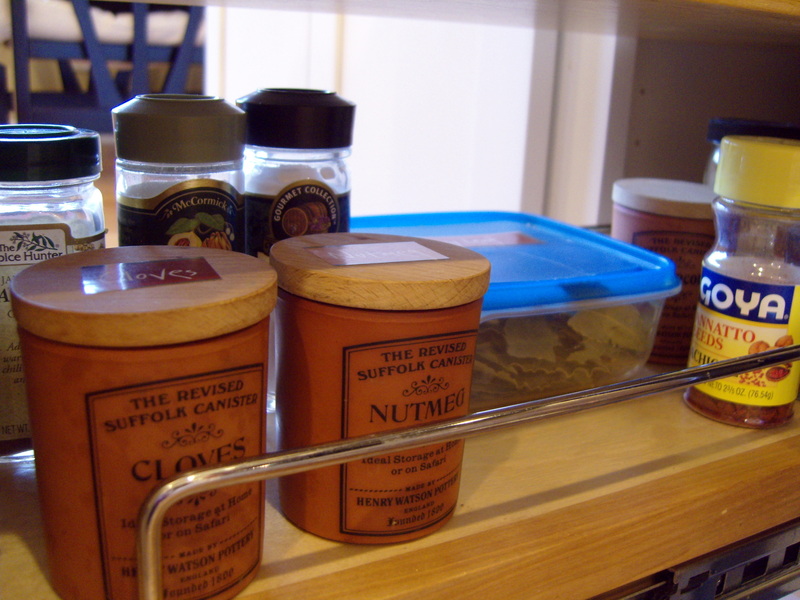 The second and third shelves have spices we don’t use as often. 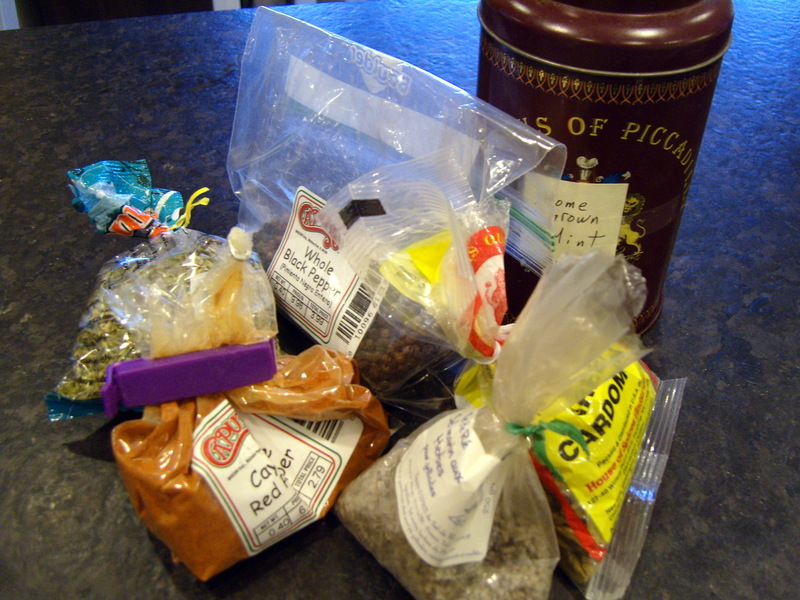 I grouped the baking spices together so they’re easier to reach for. 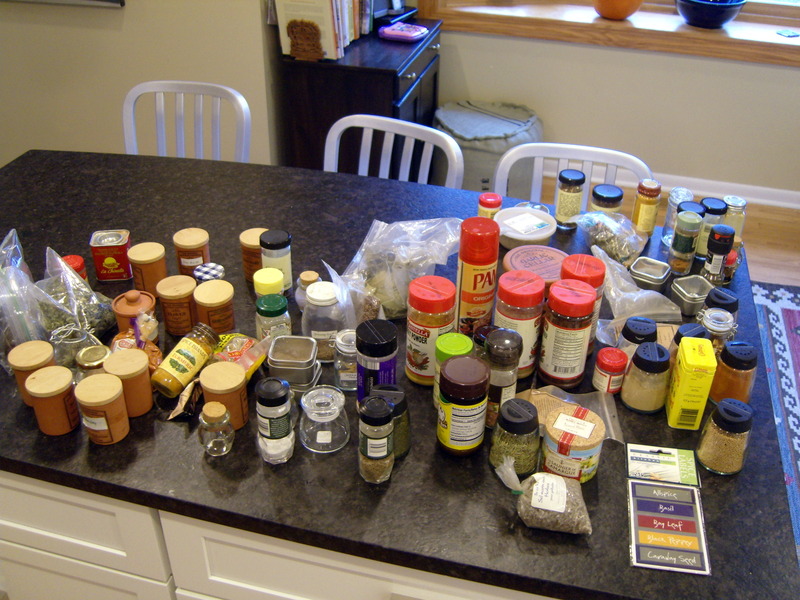 In the past, I’ve attempted to alphabetize the spices, but I’ve learned that it’s silly to have cream of tartar front and center when I only use it a few times a year. It would be nice to have all the same kind of containers, but it wouldn’t be as practical as it sounds. 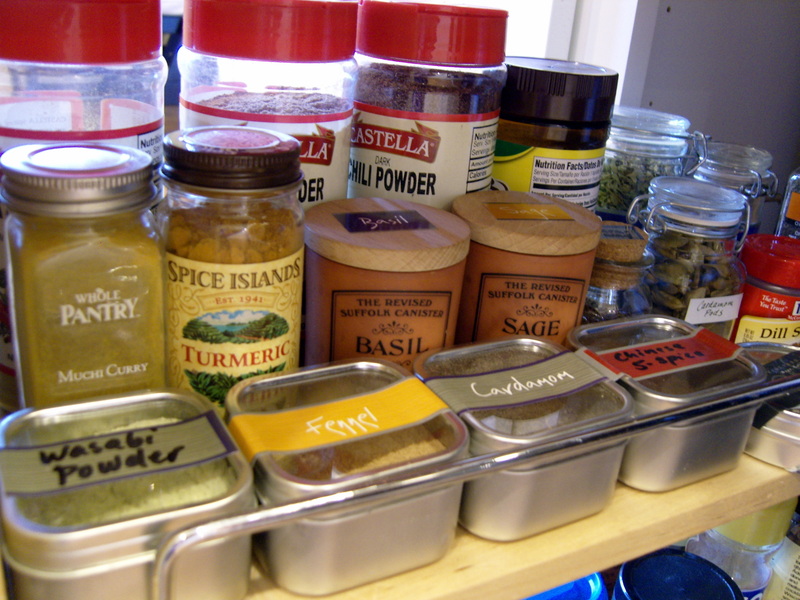 We use some spices in larger quantities and go through them quickly, so the large containers make sense for those. Some things just go stale if we have them in bulk, and some are too expensive to buy more than an ounce at a time. As long as everything is clearly labeled, I’m happy. I’m hoping the other cook in the house will express his joy in the form of a fabulous meal this weekend. We must be related because I just cleaned up the kitchen and in the process of filling up the salt and pepper mills I began to do the same. You are my inspiration! I’ve always thought a cabinet like that would be so handy, but it’s good to see feedback on some of the drawbacks. Regardless, it looks wonderful now. This makes me want to run out & buy a lazy susan for my own sad collection of spices – which are currently being stored in a shoebox! I love the motivation too! Nice work! My favorite part? “it involved some pliers, a hammer, and divine intervention.” Isn’t that how so many projects go? Thanks for posting, now I really have to get on my spices! Remarkable!! 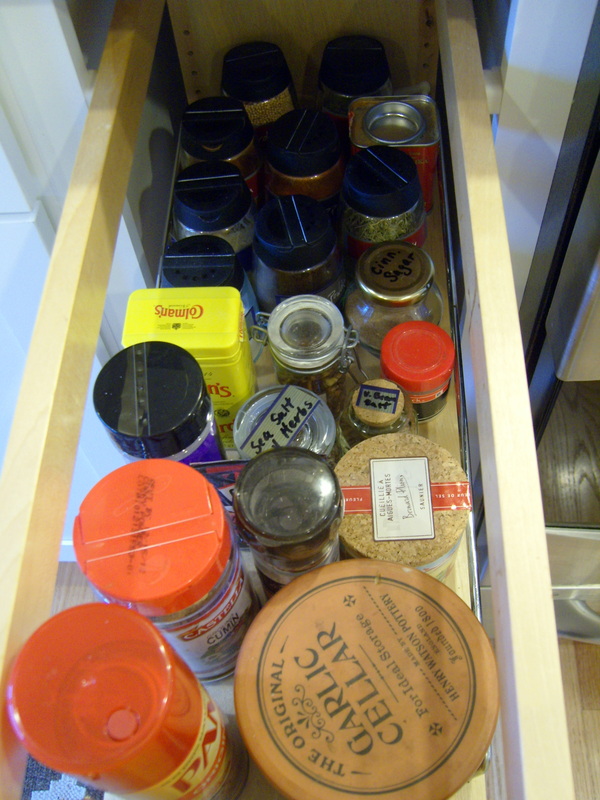 My spices only fill a lazy-susan, but they could still be given some attention. Thanks for the inspiration! That was quite an accomplishment! I need to reorganize my lazy susan now. It seems that I only use the ones on the edge of it. Everything on the inside of the circle is untouched. And of course there are things laying on the bottom that have spun off when my kids turn it too fast. I’m afraid those are gone because I don’t know how I would even get to them! By the way, I LOVE your bar stools! Or are they chairs. I’m trying to get my husband to spring for that style when we get ready to buy new ones. The ones we have are wooden and poorly made at that and they’ve been knocked over and glued back together too many times to recall. Are the metal ones durable enough for 4 rowdy kids? My lazy susan needs some work, too! I have a bunch of food processor attachments that are always sliding around and getting in the way! The bar stools are from Crate & Barrel. I love them. We’ve had them two years with three kids and they’re in fine shape. They’re very lightweight, and I thought they would be tippy, but that hasn’t been a problem. They wipe clean, too. The metal is cold if you sit down with bare legs, but if we had cushions they would just be a sticky mess! They weren’t the cheapest, but I think we bought them on sale and did in-store pick up so we wouldn’t have to pay for shipping. Well done! I was wondering how you were going to get them all back in there! Great job.